Since 2005, we have seen increasing interest in experimenting with Islamic calligraphy (i.e. calligraphy written in Arabic script) and the Arabic alphabet (which is used for writing many languages such as Arabic, Persian, Ottoman Turkish, Kurdi, Urdu) in visual time-based media such as animation. At the same time, there has been a growing demand for creating temporal typography written in Arabic script for TV, cinema, and the web. In spite of the fact that both animated Arabic typography and time-based calligraphic artworks are on the rise, so far there has been no independent study on these topics that considers the morphology and specific qualities of Arabic script. Drawing upon some qualities of Arabic script and Islamic calligraphy that can be described as “proto-animated,” this book devises and theorizes five broad categories of temporal events for the Arabic system of writing and studies the influence of those temporal events on the process of meaning-making. 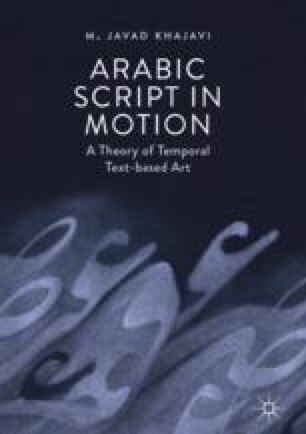 This introductory chapter provides a brief background to this discussion, introduces the main goal of the book, and reflects on the significance of a theory of temporal behaviors for Arabic script in time-based media. Brownie, B. (2012a). The behaviours of fluid characterforms in temporal typography. Doctoral dissertation, University of Hertfordshire. Retrieved from http://ethos.bl.uk/OrderDetails.do?uin=uk.bl.ethos.573315. British Library EThOS database.